Day two of my game rundown, feel free to back up to yesterday and check out the various dice games. Today I’m taking a look at what I loosely call “eurogames” which are all those games that don’t quite fit into family games or kid’s games (and aren’t roleplaying or electronic games.) With that loose of a category, today’s run-down is a doozy. Feel free to pace yourself and read it in bits… Don’t take too long, though. The family game rundown coming tomorrow is also quite formidable. While the standard disclaimer applies, all errors are my fault, I also wanted to point out that I tried to list games by distributor (the name of the company who was running the booth), which may not always be the same company/person as the publisher. If you have been alive for the past few years, you may have heard of a particular boardgame news columnist raving about Time Stories. I finally got a chance to play it. The idea is that players are investigators hopping back through time in order to fix a problem. Players have a limited number of time units and “spend” them as they move and take actions in the game. Run out of time units and you are sent back to the beginning and have to start over (presumably you’re sent back in time again) with the starting number of time units. The idea of the game is for players to go through a “run”, learning more and more about the situation and what must be done (In the scenario that comes with the game you’re trying to close a time rift in an insane asylum.) Once players have played through enough to figure things out, they can make a big run-through the game only doing the actions necessary to finish things out. I enjoyed my one round of play, and we had some fun bits of excitement through unlucky and lucky die rolls (for combat and other skill tasks.) We each had a character with a different power and were able to do some role playing along those lines. I think the game will appeal to people who like to role play a bit in their games and enjoy puzzles. Calliope will release Thieves sometime late 2015 or early 2016. For 3-6 players, playable around 20 minutes, it is a card game where players are thieves running away from the police after completing a job. Players play cards face down on themselves or face up on other players and attempt to collect the most loot. However, the deck contains police cards that slowly accumulate. When enough police cards are revealed, everyone displays all their cards and the player with the highest total loses all their cards. Play continues until all seven Getaway cards are drawn from the deck. There are a few other little flavor bits in the game, dealing with scoring and when police raids occur, but that is the gist of this (hopefully) fast playing game. 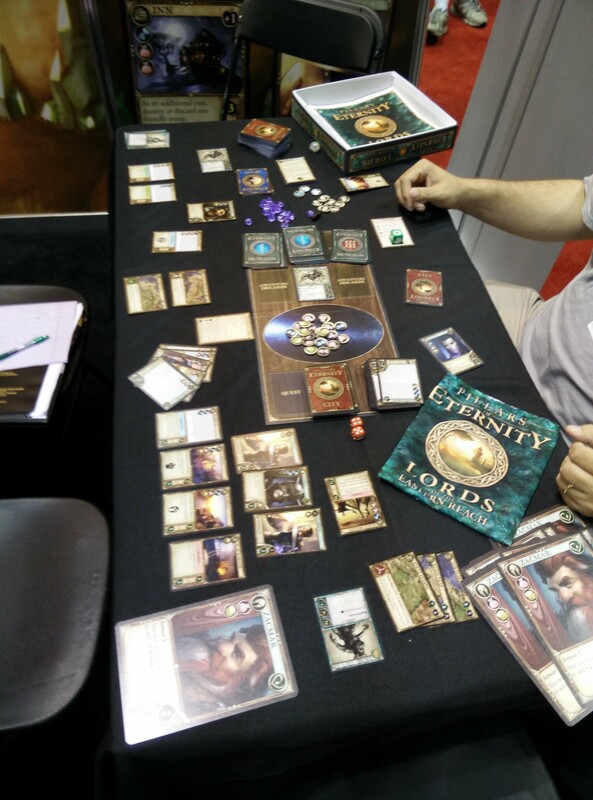 Fantasy Flight Games always has a large presence on the exhibit hall floor. A portion of that is their store, which always attracts a crowd anxious to purchase their very newest expansions. I even heard the fire marshal gave them a hard time this year, making them move or remove part of their line to a completely different location. I avoided the store, but wandered around their many displays to check out what was on offer. One game new to me was Forbidden Stars. Up to four players take on their own unique race (with associated powers and specialties) and maneuver through a 3×4 grid of space tiles (containing planets, etc…) Each location, there are 4 per tile I believe, has an income and a troop limit. The goal is to collect all of one’s racial tokens on the board, or have the most when the game runs out of time. Players use order cards (two of each of the 4 types) to advance their plans. Deploy places new units and buildings on the board, with units only placed in locations with factories. Strategize lets a player buy upgrade cards, making their units and their action cards more powerful. 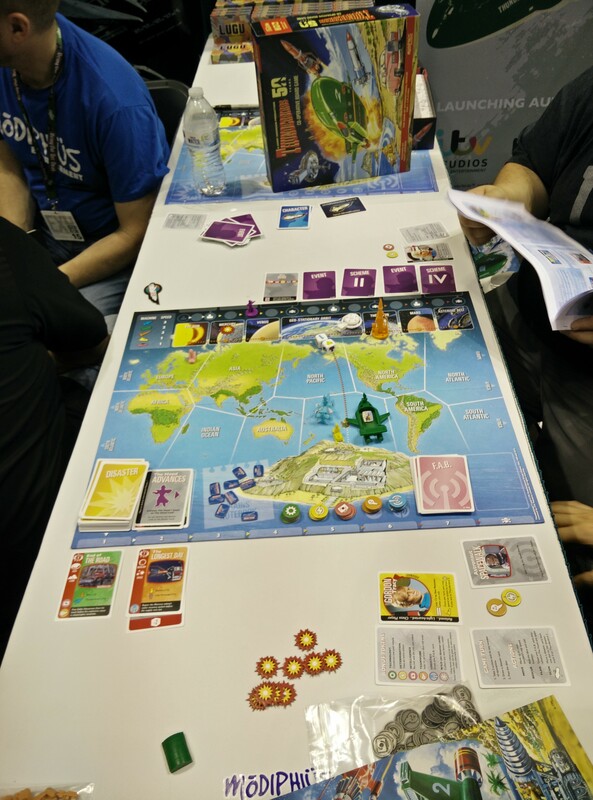 Dominate lets a player claim tokens for each controlled planet. These tokens grant a player one-use special powers to use later in the game. Each race has a slightly different benefit when choosing the Dominate action. The final action is Advance. This is where units move around the board, fighting with each other. Ships can be used to “bridge” units between planets, and can be used for “orbital strikes” if a player doesn’t want to send their units down to fight. 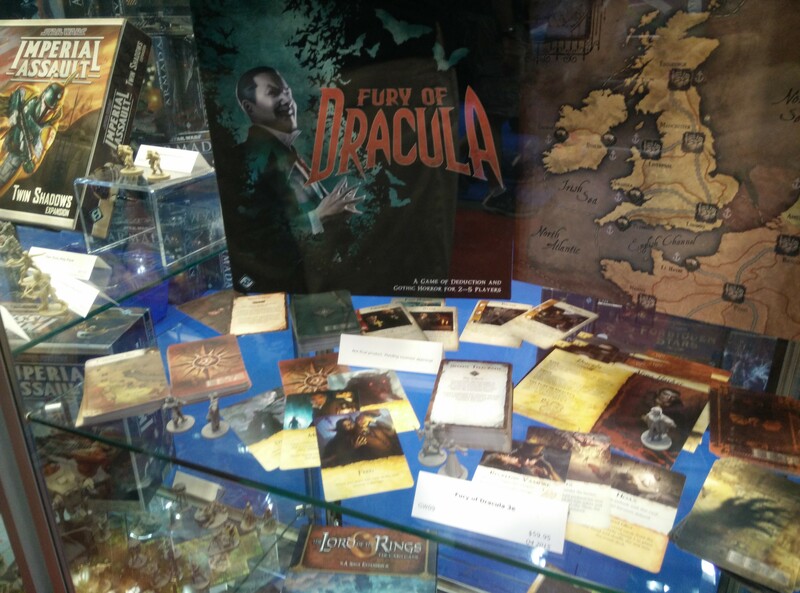 The long awaited reprint of Fury of Dracula. 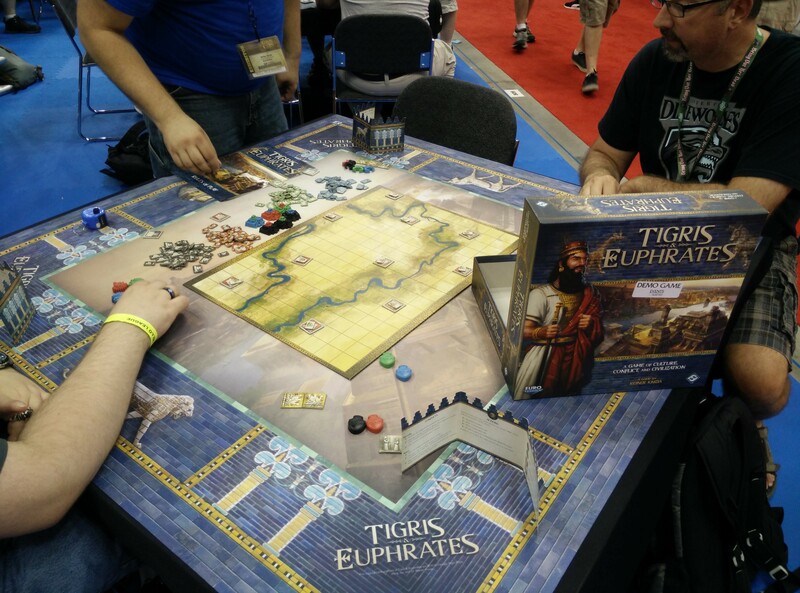 The new-ish Tigris and Euphrates. That’s not blurry, you’re just old… I’d blame my new phone camera, but I’d just be kidding myself. I loves me some superheros (check out my RPG GenCon post when it comes out), so I’m always interested in new entries into the boardgame field. It used to be a very thinly covered field but has grown along with popular culture’s interest. 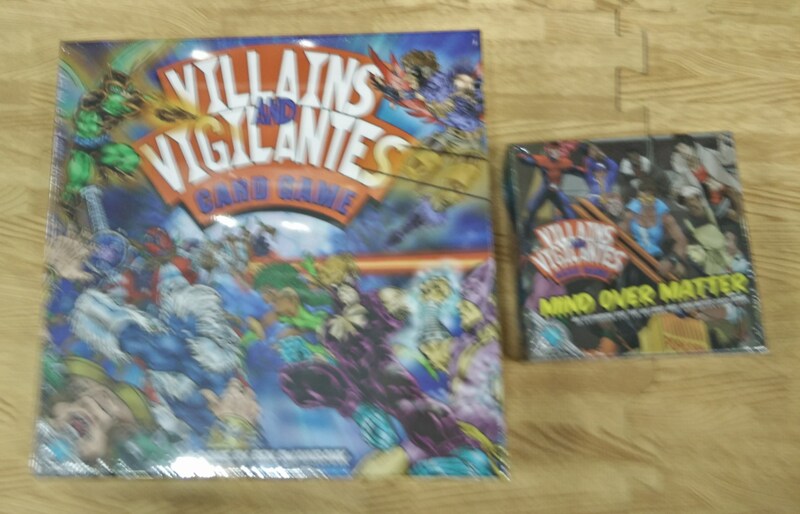 Villains and Vigilantes is a “comperopetive” game (yes, competitive + cooperative – just using the PR jargon.) A 2 player is simply head to head, villains vs heroes. Four player games fall into two teams of two, but a 3 player game is actually two villains competing against each other while trying to foil the hero at the same time. Players begin the game with a set deck of cards (containing 1-3 heroes or villains, one of up to 3 missions, and a support deck of powers.) The game board consists of locations, where characters can battle or seek to complete their missions. Players play cards for or against one another, refilling to their hand size when done. Rather than an automatic reshuffle, a player may give up their turn in order to reshuffle any spent cards and draw up to their hand size. The game comes with 12 characters (heroes and villains, some of which share cards) and a new expansion adds in a few more. The base game focuses on characters with strength or mutation based powers while the expansion, Mind over Matter, adds in mental themed powers. Known for their Sentinels of the Multiverse brand, Greater Than Games is continuing that line in several directions. There is the online app, a strategic “wargame”ish title, and the initial cooperative game. The next expansion in the main card game will be Villains of the Multiverse. It will continue the theme found in Vengeance, where players go up against several villains all at the same time. The villains in the expansion (10 of them) will be compatible with those from Vengeance, so your opportunities for mixing and matching only grow greater. The expansion will also contain four new environments, but no new heroes. Look for it early this fall. New Bedford, on the other hand, is a full on eurogame. Players are trying to succeed as whalers in the old town of New Bedford, Massachusetts. 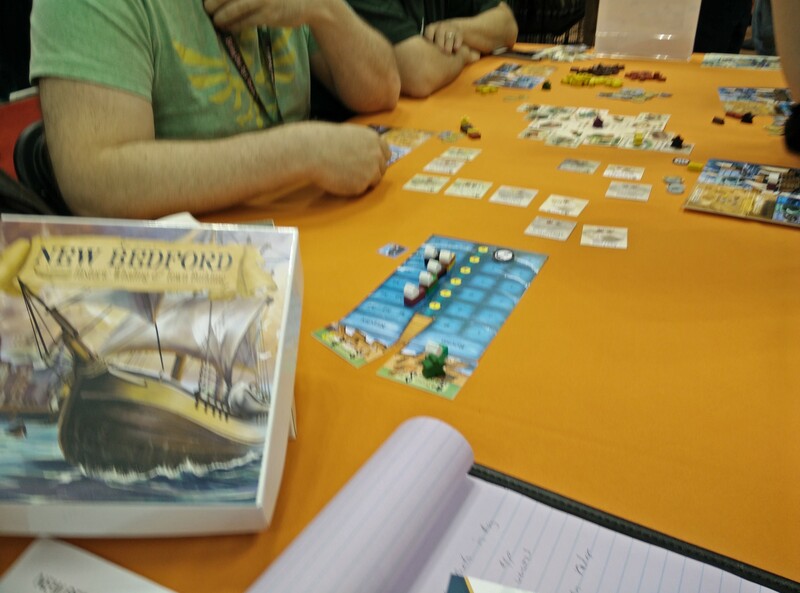 It is a worker placement game (you have two workers and two ships – no need or opportunity to try to gain more) where players build buildings in town (which can be used by other players if they pay you) to enhance your whaling opportunities. Ships are sent out to sea, with ships further out at sea given first dibs on whaling tiles that are revealed. However, to be worth much, the ship must eventually make it back to shore (which takes longer if you’re far out there) before you can score. The game does not force you into one line of strategy. Playing for just building buildings or only focusing on whaling are both viable strategies. Players can also do a very effective balance of both (but will find their resources stretching awfully thin.) The game plays 2-4 players but a fifth player expansion has been unlocked and will be a part of the game for backers on the kickstarter. One final Sentinels note is the appearance of the Sentinels Comics Role Playing Game (tentative title.) It is still in development but is planned to be less “crunchy”, more story based with fast paced 4 color action-oriented style of play. Most die rolls consist of 3 dice, selecting the median score (abilities may change that to the highest or lowest roll.) Players can build their own characters or use heroes taken from the Sentinels universe. 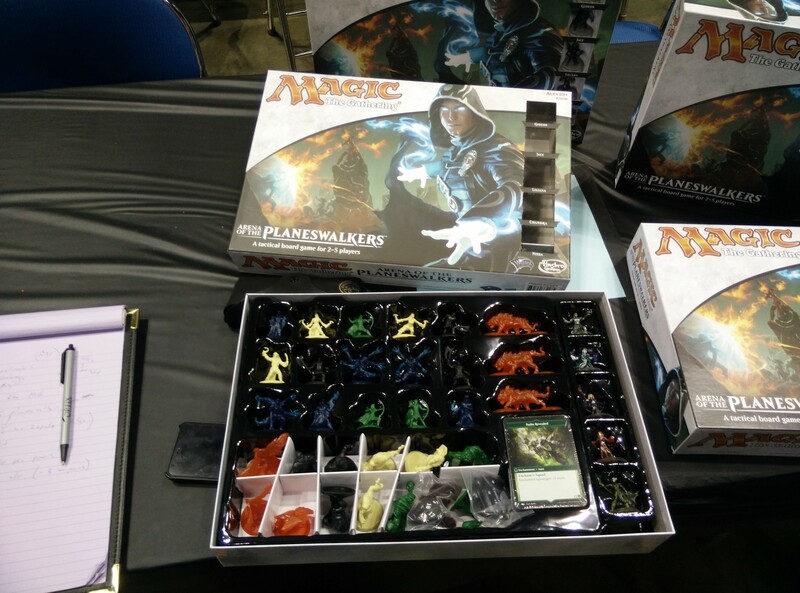 One of the games I’m most looking forward to is Magic the Gathering: Arena of the Planeswalkers. It really isn’t a eurogame, it is a combat game. However, it is designed by the same person who did Heroscape. That is a fine pedigree for me to hope it will go over with my two young boys. It is promising so far. The base game has a leader (painted) and two army troops (3 units per troop, all unpainted) for each color of Magic (white, red, green, blue, black) so it technically could be played with up to 5 players (although I suspect it would get crowded on the cardboard tiles that serve as the board.) On a turn, a player can either activate their planeswalker or one of their squads. 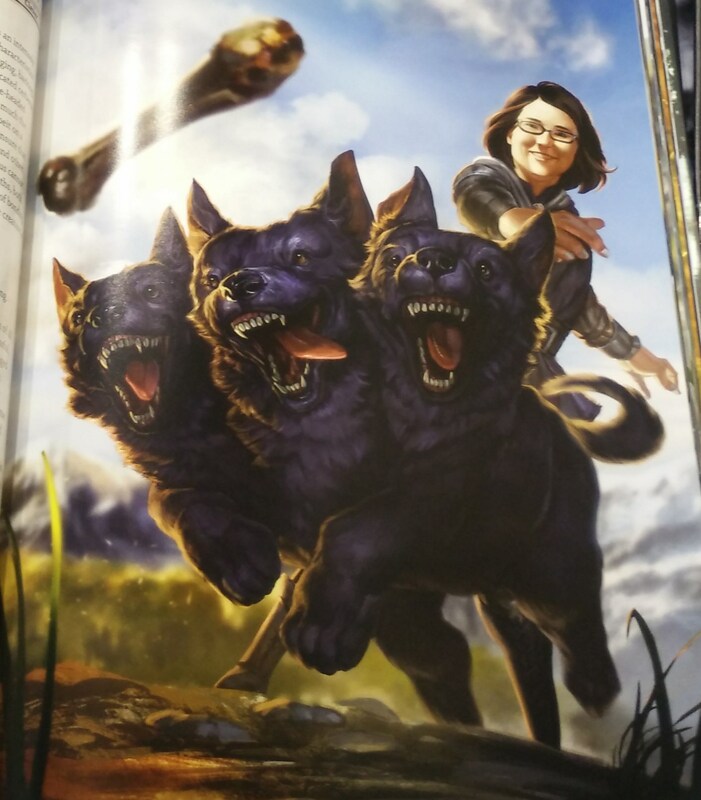 A planeswalker will either move and attack or summon another squad. Combat is very Heroscape-like with line of sight, terrain (mostly rivers), and a bit of elevation (the game only has a few Heroscape-compatible hexagon tiles.) New to this game are the spells available to each player. They fit the themes common to each color of the Magic: the Gathering game. Spells are played on one’s turn and have an instant effect or they’re played face down and are then used to respond to something on another player’s turn. There will be “rune” like tokens in some scenarios (there are suggested ones or you can just mash things together) that grant abilities to your army as long as you occupy them. The game has expansions (not collectible/randomized, thank goodness) as well, planned for early 2016. 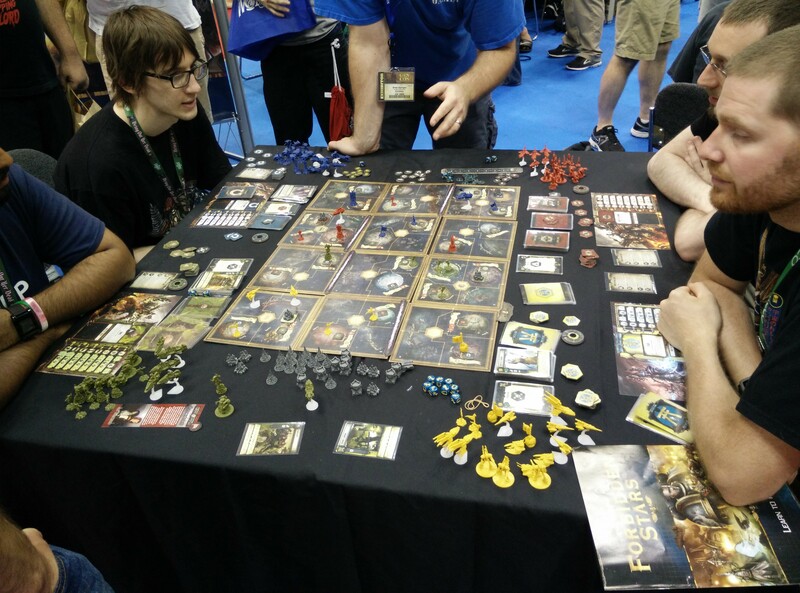 One of the intents of the game was to introduce new players to the Magic: the Gathering game. I think it succeeds in giving gamers the flavor of the game, with its spells and unique color-themed powers, but it is still a big jump over to the full fledged card game. It doesn’t matter to me, as I expect to get plenty of use out of the boardgame with my sons. 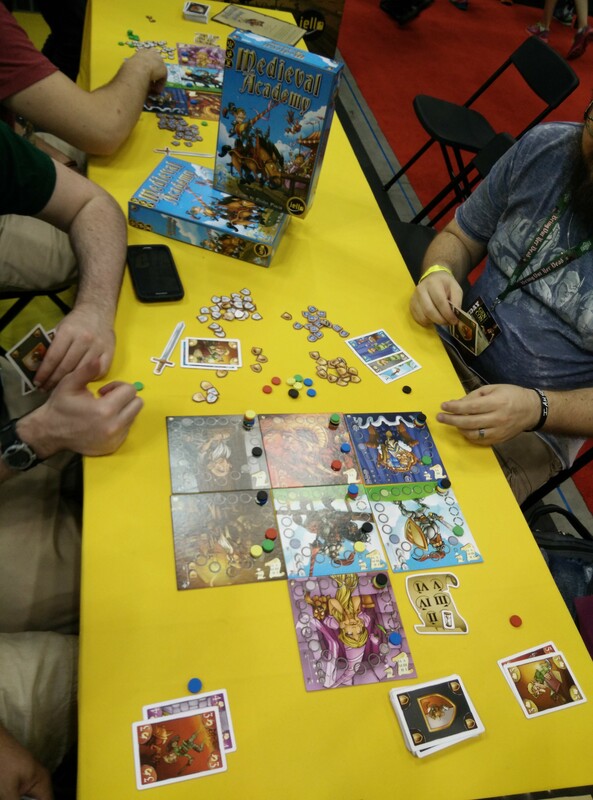 The new eurogame Iello was pushing at the convention was Medieval Academy. About a 30 minute game for 2-5 players, the premise is that several students at the academy have loosed a bunch of monsters and must now collect them again. The board consists of seven tiles, each containing an advancement track. 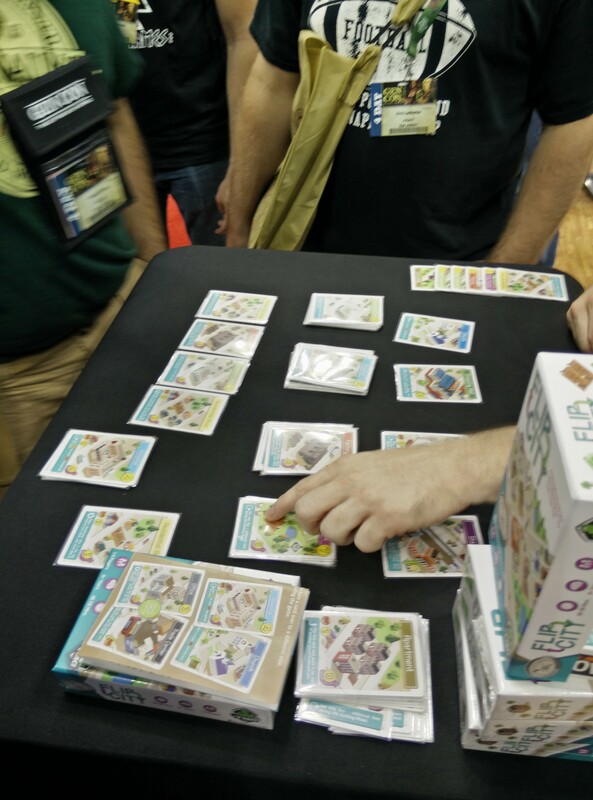 Players draft five cards and then play four of them, moving their markers along the appropriate tracks. The game lasts six rounds, and most of the tiles are scored (points for 1st, 2nd, possibly 3rd) after each round (some score only at the end, others grant points for anyone reaching a minimum.) Note that some cards penalize players for failing to reach a specific minimum. After round three, most of the tiles reset makers back to the start (or some halfway mark) opening up the competition for these tiles again for the second half of the game. To spice things up, each of the seven tiles has a back side with special effects to add more “advanced” variety to the game. I spoke with Mike Selinker of Lone Shark games about the Pathfinder Adventure Card Game line. The current series is the Wrath of the Righteous, where players are trying to fight off demons of the Abyss. Attempting to provide the game with a more “mythic” feel, it was designed after gamers clamored for a harder story line… Well, now they’re asking for things to be a bit easier next time. (Too bad scenario pack 5 coming out soon is supposedly the “meanest thing they’ve done so far.”) Organized play for the game is still going strong, and may be one of the more enjoyable ways to play. Gamers get to try out far more “unique” scenarios since they don’t have to fit perfectly into an ongoing story arc. (If you can’t go to a store, scenarios can be downloaded for cheap off the web site.) The next class decks for Organized Play will be a Paladin, Monk, Druid, and Barbarian. In the near future expect an Oracle and Alchemist (I’m told the Alchemist is a “freaky deck.”) The next big box and following scenarios will be The Mummy’s Mask, where players are raiding the Tombs of Osirion for fun and profit. It will have many mechanics based on elemental properties (weaknesses, immunities, weapon types, etc…) Expect some new cards that can be played now, but will provide serious consequences later on – making hard choices. Lone Shark Games is also self-publishing their own cooperative card game, Apocrypha, set in a modern/horror themed world where players are slowly accumulating lost fragmentary memories. Like the Pathfinder game, players have their own decks and progress through the game, but it is set up in a nonlinear fashion. Players can complete any of the 9 chapters in any order. Dice are simplified (only d6s are used). (One mechanic used will be seat adjacency, so be sure to sit by players you trust!) The Kickstarter is over for it, but the pledge manager will be opening again for those that missed it. Expect it some time next year. The new games seeing a bit of hype were Isle of Skye and Trambahn. 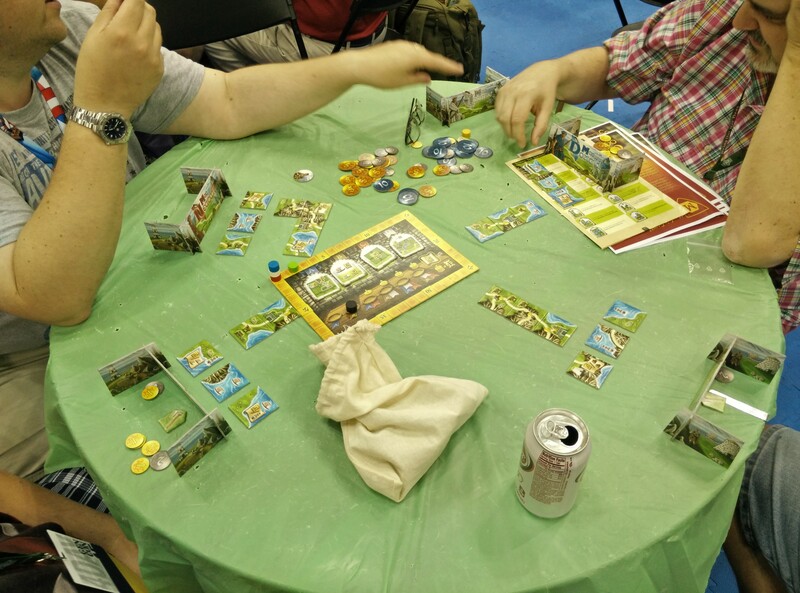 In Isle of Skye, 3-5 players take 3 tiles, chuck one, and secretly assign a price to the other two. All the tiles and prices are revealed and then then players purchase one tile from another player, giving them the cash. Any tiles not purchased are given to the auctioning player, with their cash going to the bank. Thus a player may get 0 to 3 tiles per round. Purchased tiles are then placed into a personal tableau, forming a Carcassonne like set of connected tiles. The game has 16 different possible victory point goals and four of these scoring tiles are drawn per game. The game goes 6 rounds, with each round scoring one (or more) of the four drawn tiles. Trambahn is a two player train-themed game that shares a lot of card play to Lost Cities. 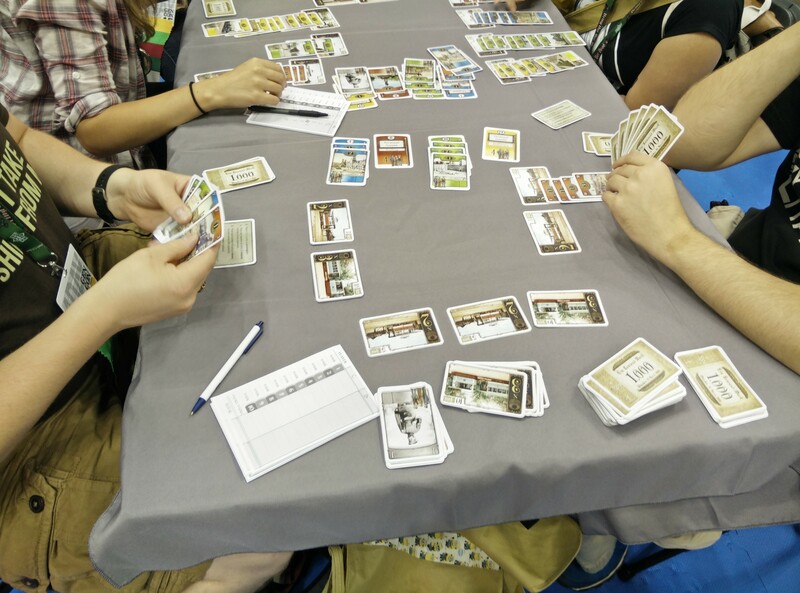 Players use cash to purchase a train engine and then play cards of the same color in ascending order. Each turn a player assigns one or two cards to Terminal Station and then plays as many of their own cards onto their own train tableau. Unplayed cards are converted to cash, used to buy more trains. When a terminal station card has a total of 4 cards, that color train is then scored. Cards on that station are then removed. Note that players may start multiple trains of the same color, as long as they all obey the ascending rule. As the game progresses, more expensive train engines become available, which give a larger scoring multiplier. The game ends (I think I recall) after 10 scoring rounds. Two games that were not on display but are coming down the pike are games licensed from PBS. Yes, PBS. Mystery is a game with a Film Noir feel that looks a bit like Clue at first glance. However, it is not. The game starts with the death of a character and then players begin to play arrow tiles onto the board to make links to the murder, implicating different characters. In true film noir style, these connections can get pretty complex. I may be accused of the murder but that may have been clouded by the fact the another character is secretly in love with me but is also jealous of my love child with yet another. I think fans of the genre will enjoy the theme and suspect fans of “take-that” style play will have an interest as well. The other PBS title is Antique Roadshow (yes, you read that right.) Rather than a game about the show, it is a game about the lead-up to the show. Players each bring two items to the “tryouts” of the show and get in line to get their items appraised. If I bring a bowl and a painting I have to choose which line to enter – if my bowl is worthless and I have a great painting, if I’m in the bowl line I’m just going to lose out. Players play as both the entrants as well as the judges. Themed from their computer RPG, Pillars of Eternity, in Lords of the Eastern Reach players are the lords and ladies who are the quest givers in the PC game. The game accommodates 2-4 players, with a solitaire variant available. Players all start with 5 cards. On one’s turn, a player uses their heroes (unique) and troops to either flight the dungeon (for gold and VPs) or other players (for VPs). They then draw resources from a bag and play any city/army cards they can until they use up all their resources. In an interesting twist, any resources unused are passed to the next player, and so on until they are all used up. After all players have taken a turn, the event die is rolled and does bad things, typically to the leading player in one of several different categories. Depending on your starting character, you begin with different starting slots for buildings and characters. The city deck is comprised of 24 cards and when it is depleted the game ends. Victory points primarily come from buildings, but can also be earned adventures and items found along the way. There is a solitaire variant, as well as variants that get rid of the player vs player attacks. In an interesting twist, there is even a campaign mode of a series of 8 linked stories where winning one game gives bonuses to that player in the next scenario. Expect it out in early 2016. 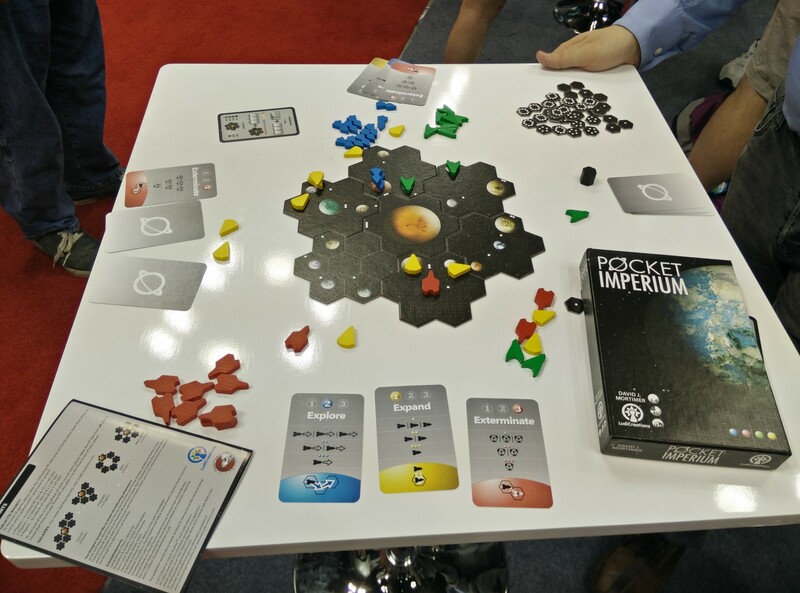 Coming out in two weeks is the fast-playing, 2-4 player Pocket Imperium that should play in about 30-45 minutes. 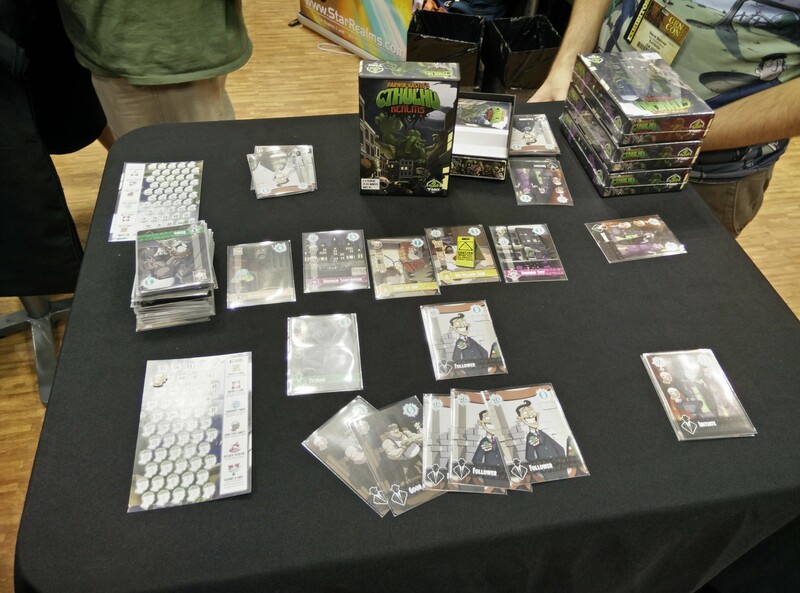 One of a few games at the convention relying on the simultaneous selection of action cards. The game board consists of a central hexagon surrounded by one ring of hexagons. Players attempt to place ships onto the planets on the board (some hexagons have multiple planets, some are empty space) in order to score points for each occupied planet. Each player chooses one hexagon to score that round, with the player controlling the center picking an additional location. The game provides a player with three options each round: Expand, Explore, and Exterminate. Expand puts ships on the board at already occupied locations, Explore allows ships to move, and Exterminate allows players to invade and destroy opponent ships at a 1:1 ratio. Thus, attacking 1 ship with 2 of your own will leave you the winner with 1 ship left. Players secretly select their actions and then reveal. The catch is that playing a unique action provides better results. Action cards are compared to your neighbors and lose one utility for each match. Playing expand when your neighbors do not, nets you a cool 3 ships to place. If all three of you play Expand you get a lonely 1 ship. After all the actions are played in order (Expand, Explore, Exterminate) ship upkeep occurs (Exploit) where players can only have 1 more ship present than the planet supports (so empty space supplies a single ship.) After six rounds (2-3p) or eight rounds (4p) the game ends. I like a fast 4X type of game, so am interested, but don’t see it coming out much as a 2 player game. 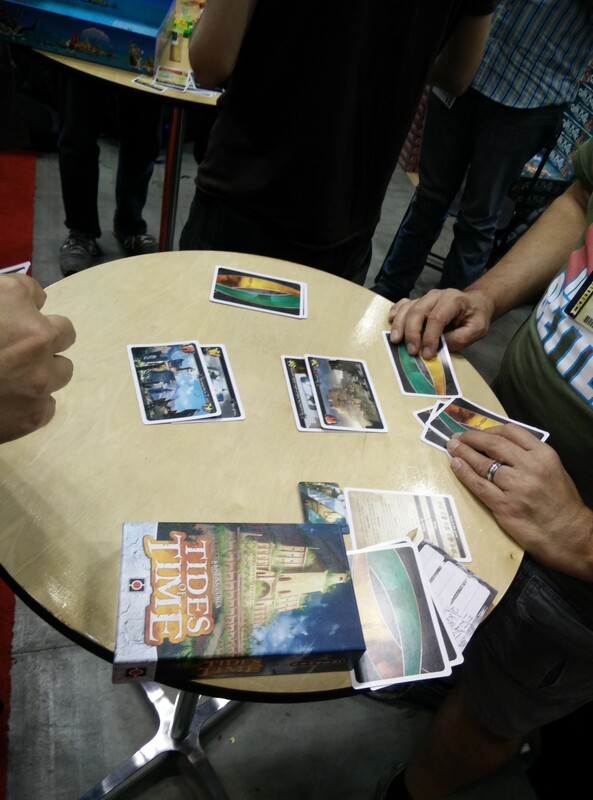 Tides of Time is a two player drafting game consisting of only 18 cards and lasts 3 rounds. Players start by drafting 5 cards, playing them face up in front of them. Each card has a suit and also provides rules for scoring additional points at the end of the game. After all five cards have been drafted and played, points are scored according to the displayed cards. Players then leave one card on the board, trash one permanently, and pick 3 back up for the next round of a 5 card draft. Repeat two more times and declare the winner. Another in the “tiny card game” entry, popular over the past few years, it seems to be unique enough to stand out. It reminds me of a very slimmed down Fairy Tale combined with scoring a bit like Eminent Domain: Microcosm, both games I enjoy. 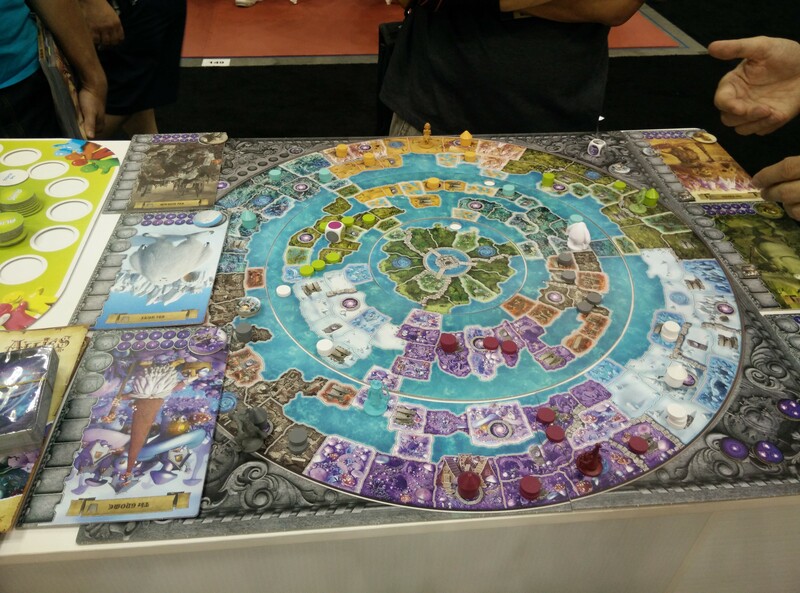 A very beautiful board (perhaps a bit crowded) attracted me over to Realm of Wonder. Much of the game focuses on a race through concentric circles of a board that rotate over time. At the same time, players can cast spells from their hand to affect the game. Building magical towers gains one experience which opens up more powerful spells. Of course, other players can destroy towers to knock your experience back down. The true goal of the game is to accumulate magic, but the race is a big part of that. To prevent players from reaching the middle, only specific locations can “bridge” across outer to inner circles. Casting spells to rotate the inner rings will move the bridges around, often foiling your opponent’s’ plans. Players have their own character, each with its own special abilities. The game also has a number of scenario setups to be played, although most of these center on simply destroying your opponents. Despite my dislike for the whole Cthulhu theming, Cthulhu Realms is a game in which I’m quite interested. Yes, it sounds like Star Realms and it essentially is, as the designer has permission/license (or whatever) to rework the Star Realms type game. The two resources in the game are money and sanity. Lose all your sanity and you lose the game. Players take turns playing attack cards against each other and money-collecting cards to buy better cards for their deck. Most cards are only around one turn but some cards stick around (bases in Star Realms, Locations in this game.) There are several changes from Star Realms, and they all seem to be for the better. There are only three “suits” so combinations are easier to achieve (and there are some “multicolor” options as well.) The draw pile is face-up so trashing a card in the central tableau is much more strategic (you know what’s coming.) There is more healing in the game and in addition to locations (bases) that require attacking before the other person, there are locations that are required to be attacked before other bases. Finally, the base game comes ready-to-play with up to four players. Rather than a central tableau of cards, players share a tableau of cards with each of their neighbors. All in all, I can see the advantage of the changes made and am hoping to get the game to the table soon. Thames and Kosmos have reprinted Legends of Andor with a new rules translation, making it slightly different than the previous Fantasy Flight version. They are also offering up two new expansions. The Star Shield is a new set of missions, and New Heroes provides 4 new heroes to use in the game (surprise!) Look for all that in the November/December time frame. Also coming down the pike is Steam Time (a game I only grasped mildly, it is supposed to be a steampunk, flying, time travelling, something or other game.) I believe it should be available in December. I did find out an expansion is coming down the pike, it was being shown in the playtest hall. Tumult Royale is being marketed as a 2nd generation version of Catan (by the same designer), again with resource management. The goal is to build as many statues of yourself in the kingdom but a player needs to carefully balance their greed. Soak your citizens for resources too often or too hard and they’re revolt on you. Tumult Royale should also be out in December. Sadly, not all that much for detailed information. I think it was a booth I visited under stringent time constraints. I’ve played through many games of the iOS version of Star Realms, enough that I was convinced to purchase the physical game. I’m glad to see another expansion come out. 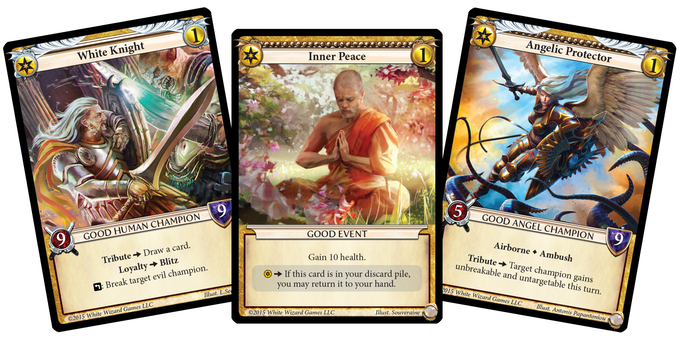 Cosmic Gamit, unsurprisingly, presents players with more Gambit card options – cards that offer each player a unique, one-use ability. I’m a bit on the fence about Gambit cards, I think some are clearly more powerful than others, but I have to admit they do add a bit of variety in early game strategy. The new game coming out from White Wizard is Epic. It should be in stores in a September/October timeframe. It is one of those “living card games” where it will be expanded with new packs of non-randomized cards for those who wish to expand their deck options. The game focuses on champion and event cards. To start, players actually draft their deck of cards. During each player’s turn, they collect one coin and then may play any number of cards. The deck consists of champions, placed on the table and used to attack other players, and events, which are used like instants. An effort was made to make every card in the deck “cool” so that a player will look at their hand and try to decide which crazy card they will play next. Since cards only cost 0 or 1 coins, the game wastes no time in getting into the thick of things. 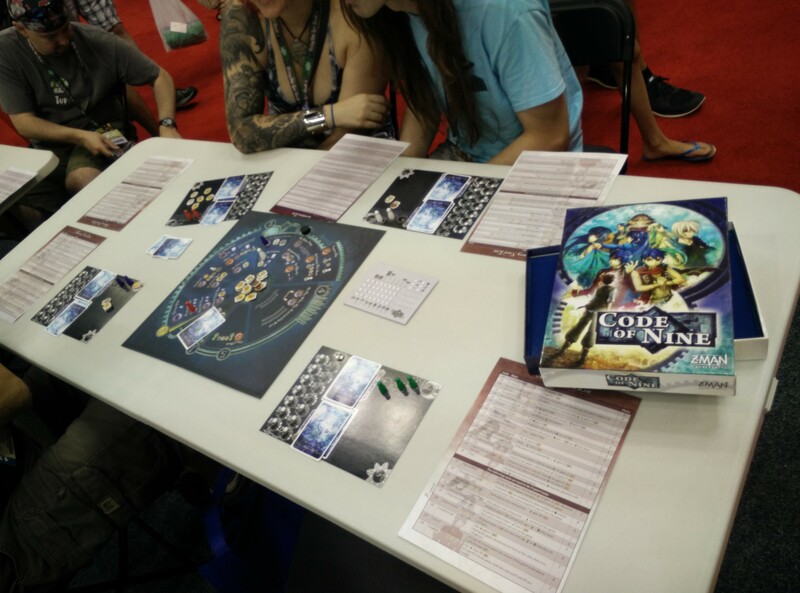 Z-Man’s Code of Nine was receiving plenty of attention and there were several tables dedicated to its play. Players begin this worker placement game with two secret cards which provide modifiers to the values of the main resources in the game. 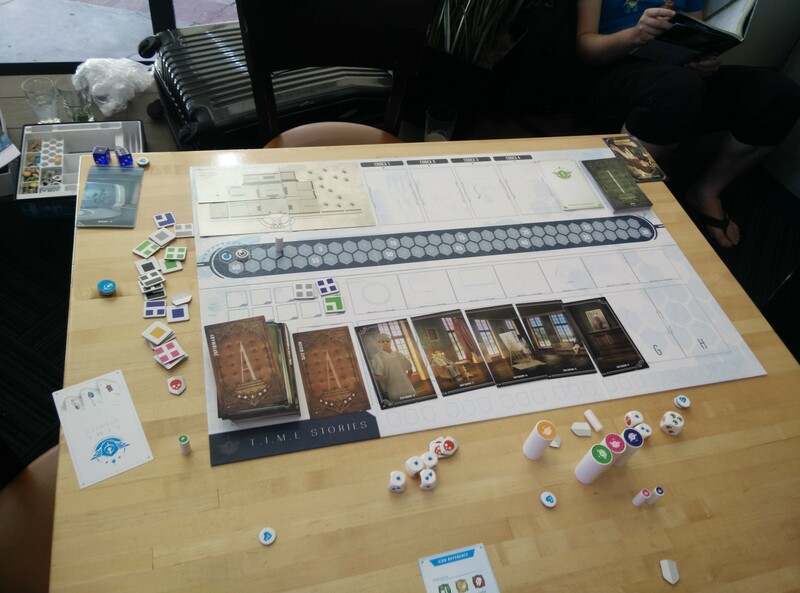 Similar to a stock market game, players then attempt to both collect the resources while simultaneously trying to modify their values. Each player has three workers that can be placed on the circular board. The board contains five sections. Each round, another section of the circle becomes available for placement. After five rounds (four if someone triggers an endgame in round 4) the game ends and points are scored. The worker locations primarily adjust the prices and ownership of the main resources, with more powerful locations requiring the expenditure of “will” (which I believe is a non-scoring resource.) The board looks very elegant, although it may be a bit intimidating to a newer gamer, note the impressively sized reference cards. There are 18 “secret” point value cards, with 10 more considered useful in in “expert” play, so gamers should find a bit of variety to the game. Whew… see you tomorrow with Family Games….